I swiped this gorgeous photo from Saveur, too. I have been quiet this week because I’ve been struggling with a particular post I have in mind—it’s a little complicated. It’s not ready yet, but stay tuned. And at home, my cooking has definitely slid into a rut. This may sound like a negative thing, but I assure you in this case it is fully positive: The weather has changed, and there have been lots of fun get-togethers and trips, so we have been extra-busy in that delightful way that happens in the spring when we all come out of our SAD hibernation. Which only means I’ve been coming to rely on my dinner workhorses even more than usual. Add in that I am waiting with excitement bordering on the deranged that my CSA is just about to start, which means that the whole way I organize meals is about to change. So for the time being, there’s not a whole lot of inspiration coming out of my kitchen. That’s okay with me, but maybe a little disappointing for you. To tide you over, here are two things that have caught my attention that I will absolutely cook as soon as I have a free moment to try something new. 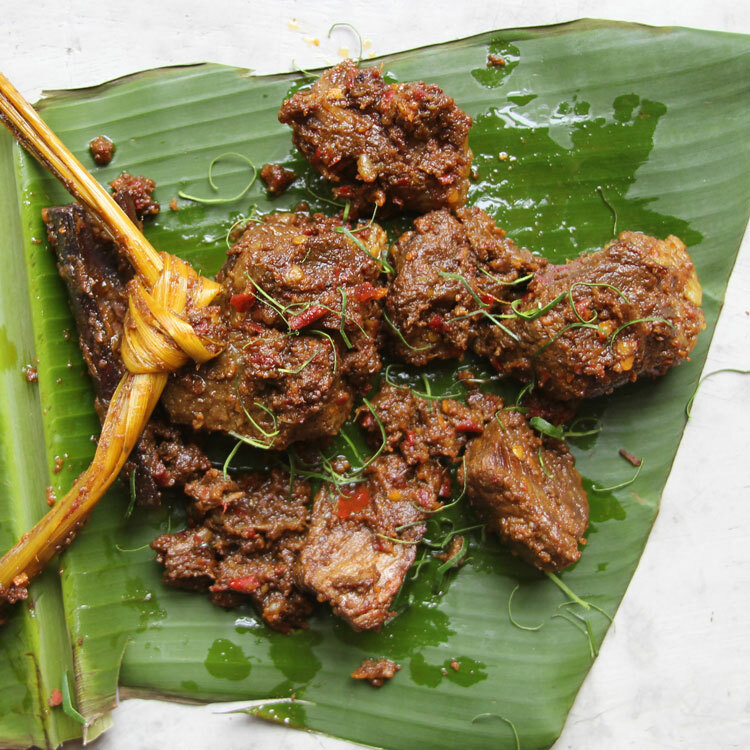 The first is this Indonesian beef rendang, which appeared in this month’s Saveur (the whole current issue, quite frankly, is particularly difficult to read on an empty stomach). It has everything going for it—it sounds pungent and spicy, with some serious flavor bang-for-my-buck in terms of labor required to cook it, and it apparently tastes amazing whether freshly cooked or at room temperature, which is very appealing at this time of year. Just the thought of that beefy sauce staining the rice beneath it is enough to send me running to the Asian grocery store. The other is a simple recipe for Gai pad krapow that my friend (and blogger extraordinaire) Adam Kuban posted on his facebook page (along with some expletives asking why he had waited so long to try it) from Serious Eats. I have cooked Thai food before—I know how straightforward it can be, as long as you get the right ingredients. And I love Thai food, and I have a hard time finding satisfying Thai where I live, and yet I never cook it. Why? No good reason, really. Sometimes what you need to shoehorn you out of your rut is a kick in the pants from the most unexpected of places. Why not give it a try?